Why Do Manga Magazines Use Colored Paper? 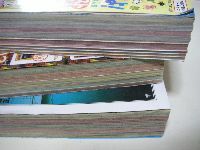 As many manga readers know, manga magazines often contain colored pages. Seinen magazines have a mild transition of color pages; they change from cream to light orange, and so on. On the other hand, Shounen magazines, like Shounen Jump and Shounen Sunday, and Shoujo magazines, like Ribbon and Ciao, use intense colors for their paper, like yellow, orange, green, etc. *Note the “color pages” discussed here is not the “full-color” pages that appear in the beginning of a chapter, but the actual color of the paper the ink is printed on. In general, it is said that manga magazines use colored paper to cover up their poor quality. If this is true, why would the magazines use various colors to cover up their poor paper quality when colors seem to cost so much money? A certain manga editor once said, “We use second-hand paper in magazines to reduce costs. We are not aiming to make the magazine more interesting by changing the color of its paper.” The publishers don’t use colored paper to make their magazine more interesting, the color is used to cover up the old colors of second-hand papers. In old times, the page color in a magazine changed in the middle of the story, which agitated the readers. Nowadays, the page color changes as each story ends; it makes it easy for people to locate their favorite story, and provides a refreshing change of pace. Submitted by ssjohn (not verified) on Sun, 2006-11-05 21:51. "Electronic Paper" the Future of Newspapers and Books?